1Equipe Composants Electroniques Organiques et Photovoltaïques Moléculaires, Département de Physique, Faculté des Sciences de Monastir, Monastir, Tunisie; 2Department of Material and Polymer Engineering, Faculty of Engineering, Sabzevar Tarbiat Moallem University, Sabzevar, Iran. The effect of composition and annealing temperature on charge transfer properties, in a donor/acceptor nanocomposites based on poly(2-methoxy-5-(2-ethyhexyl-oxy)-p-phenylenevinylene) (MEH-PPV) and MWCNTs functionalized with Polystyrene (PS:MWCNTs), have been investigated. The quenching of photoluminescence (PL) intensity of pure MEH-PPV, by adding different amounts of functionalized carbon nanotubes, exhibits that a photoinduced charge transfer has been occurred. Charge transfer efficiency was obtained for an acceptable concentration of PS:MWCNTs about 0.5 wt% and at annealed temperature of about 80˚C. Quenching efficiency studies imply that MEH-PPV/PS:MWCNTs nanocomposites reveal a high degree of PL quenching, reaching a value of η = 76.9%. Carbon nanotubes (CNTs), reported by Lijima in 1991 , are long cylinders of covalently bonded carbon atoms. There are two basic types of CNTs: single-wall carbon nanotubes (SWNTs) and multi-wall carbon nanotubes (MWCNTs). SWNTs are considered as a single graphene sheet rolled into a cylinder and MWCNTs are consisted of several concentric cylindrical shells of graphene sheets. The particular structure of carbon nanotubes, their nanometer scale diameter, high flexibility, low density and high aspect ratio makes these nanofillers particularly attractive to be investigated as reinforcement in polymer nanocomposites and be integrated as active materials [2,3]. However, several issues concerning the dispersion of carbon nanotubes in the polymer matrices and its effects on the properties of the resulting nanocomposite polymers [4,5] remain to be addressed. The functionalization of CNTs is an effective way to prevent the aggregation of carbon nanotubes and to improve their dispersion in solvents and within a polymer matrix [6,7]. The interfacial adhesion could be modified through interactions between the functional group on the nanotubes and the conjugated polymer for optimal nanocomposites properties, including optical properties based on charge transfer efficiency in devices addressed for photovoltaic applications. It seems that functionalization of CNTs with polymers like polystyrene bring interesting behaviour to CNTs and improves its dispersion in polymer matrix. For this reason, we have considered in our research the possibility of investigating MWCNTs functionalized with Polystyrene (PS:MWCNTs) as acceptor nanofillers within MEH-PPV polymer. 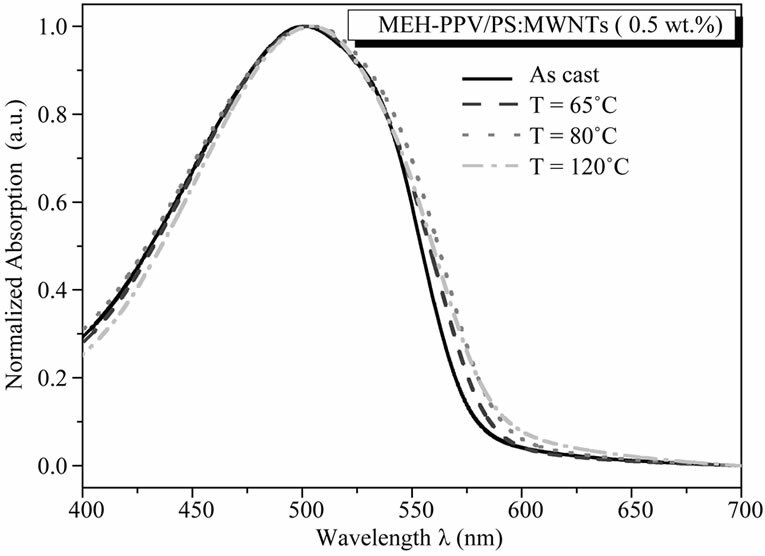 Based on optical measurements, this study contains two parts: 1) The effect of PS:MWCNTs concentrations on polymer nanocomposites; 2) The effect of thermal annealing treatment of MEH-PPV/PS:MWCNTs nanocomposites on charge transfer efficiency. The obtained results demonstrate that a photoinduced charge transfer has been occurred at MEH-PPV/PS:MWCNTs interfaces and exhibit a great effect of these parameters (nanofillers content and annealing treatment) on optical properties of MEH-PPV/ Carbon Nanotubes nanocomposites. MEH-PPV was purchased from Sigma Aldrich. The molecular weight of MEH-PPV was reported as Mn = 86,000 g/mol. PS:MWCNTs were synthesized as following: 0.1 g of MWCNTs was suspended in 10 g of styrene and sonicated for 2 minutes, then this suspension was added into a water solution of surfactant (SDS), (0.1 g SDS in 90 g of distilled water) and sonicated for 2 minutes under stirring to create droplets. A stable mini-emulsion was obtained and it was transferred in a three necked round bottom flask connected with a condenser and gas inlet and outlet tubes. Oxygen was removed from mini-emulsion by means of a positive flow of nitrogen for 30 min. Then, it was heated up to 70˚C and little amount of ammonium persulphate (APS) was added as an initiator and the polymerization was carried out for 4 hours. The nanocomposite films were prepared under ambient temperature by spin-coating from an homogenous chloroform dispersion of the blended materials onto glass suprasil. Blends of MEHPPV and PS:MWCNTs at weight ratios (PS:MWCNTs/MEH-PPV + PS:MWCNTs): from 0 wt% to 10 wt% were prepared by stirring for several hours in chloroform solvent at a viscosity of 10 mg/ml. 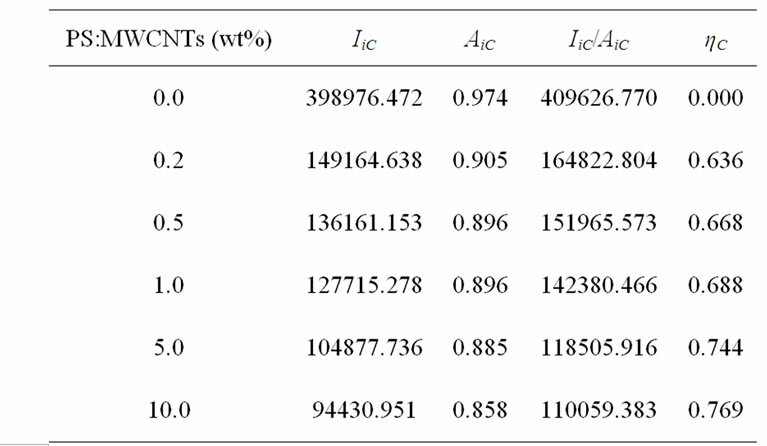 Individually dispersed PS:MWCNTs were apparent, while large aggregates were present in the solution containing MWCNTs without PS, even after a long period of ultrasonication. For thermal treatment study, MEH-PPV/ PS:MWCNTs (0.5 wt%) samples were annealed under vacuum at various temperatures: 65˚C, 80˚C and 120˚C. UV-visible absorption spectra were measured by PerkinElmer Instruments, Lambda 35 spectrophotometer. Photoluminescence spectra were collected with a JOBIN YVON-SPEX Spectrum One-CCD detector, cooled at liquid nitrogen temperature. The excitation wavelength was selected to be at 500 nm. This work will be based on investigating both absorption and photoluminescence spectra of nanocomposites as function of composition of PS:MWCNTs and annealing treatment. The obtained curves will be analyzed by exploiting two tools: the quenching efficiency parameter (η) and the Stern-Volmer (SV) relation. 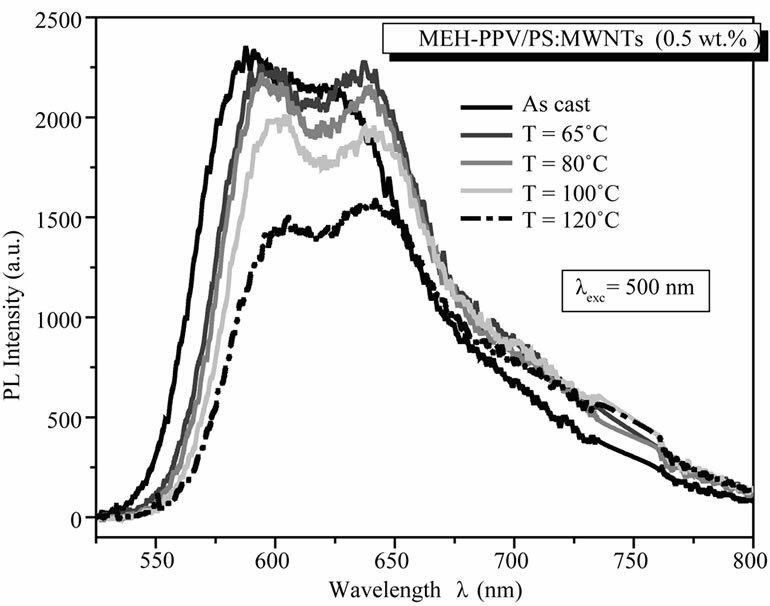 The absorption spectra of MEH-PPV/PS:MWCNTs nanocomposite ﬁlms, for various concentrations of PS: MWCNTs, in the wavelength range from 400 to 700 nm, are shown in Figure 1. Upon addition of PS:MWCNTs, the absorption peak of MEH-PPV (at 500 nm) gradually decreases. It is probably due to the reduction of optical volume of MEH-PPV polymer . Moreover, as concentration of PS:MWCNTs in MEH-PPV/PS:MWCNTs ﬁlms increases up to 0.2 wt%, the absorption edge shifts toward high wavelength wave further in the range of ~5 nm. Such red-shift of the absorption peak of MEH-PPV polymer is owing to the change of effective conjugation length of the conjugated polymer in the presence of carbon nanotubes . 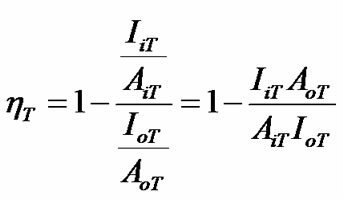 In fact, the addition of CNTs to π-conjugated polymers was found to improve the quantum efficiency of π-conjugated polymers because the interaction between the highly delocalized π-electrons of CNTs and the π-electrons correlated with the lattice of the polymer skeleton. It is major to note that the UVvisible absorbance of nanocomposite ﬁlms was almost completely dominated by MEH-PPV due to the very minor contributions of PS:MWCNTs. The quenching of the PL intensity of an appropriate donor polymer by a suitable acceptor material gives an indication of an effective photoinduced charge transfer at donor/acceptor interfaces [10,11]. Thus, the PL spectra of the MEH-PPV/PS: MWCNTs were investigated, as shown in Figure 2. From Figure 2, it can be seen that the MEH-PPV polymer film shows strong photoluminescence between 525 and 750 nm, with excitation at 500 nm. The photoluminescence intensity is reduced when adding PS: MWCNTs nanofillers. The progressive decrease in PL intensities show that the excited fluorophore in the MEH-PPV backbone was quenched by the electronic interactions at the MEH-PPV/PS:MWCNTs nanoscale. Figure 1. 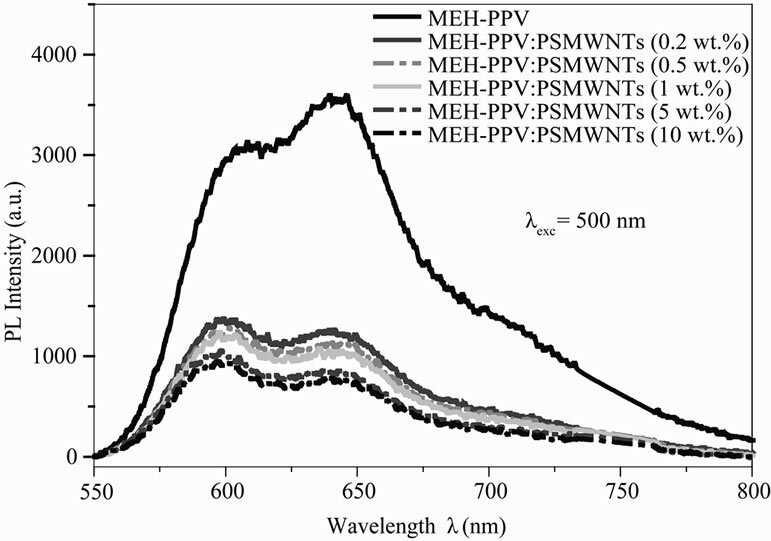 Absorption spectra of MEH-PPV/PS:MWCNTs nanocomposites with different concentrations of PS:MWCNTs. Figure 2. 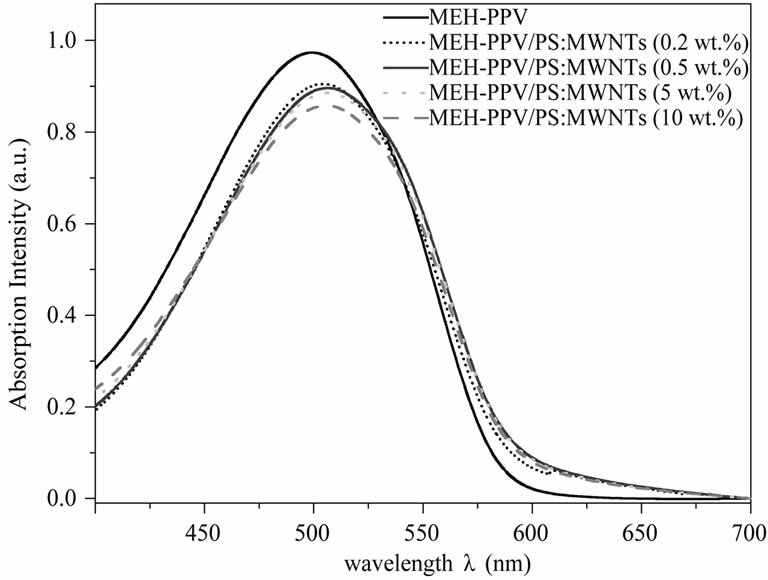 Photoluminescence spectra of MEH-PPV and MEHPPV/PS:MWCNTs nanocomposites. These results indicate that an efficient charge transfer has been occurred between MEH-PPV and PS:MWCNTs interfaces. Furthermore, the high length to diameter aspect ratio of MWCNTs greatly supports charge tunneling between the donor-acceptor systems through polystyrene (PS) shielding nanotubes. The efficient quenching of the PL emission shows that fast charge separation and slow charge recombination are consistently observed, thereby suggesting that functionalized MWCNTs (PS:MWCNTs) are expected to be a competitive candidate for the acceptor material in polymer organic solar cells. 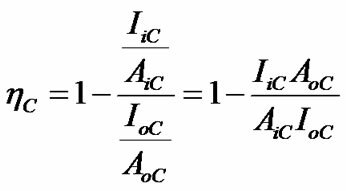 where, AoC: Absorbance intensity without PS:MWCNTs; AiC: Absorbance intensities with PS:MWCNTs; IoC: Integrated photoluminescence intensity without PS:MWCNTs; IiC: Integrated photoluminescence intensity with PS: MWCNTs. The expression of quenching efficiency parameter ηC link optical properties of donor-acceptor system at fundamental and excited states, which allows consequently to further understand the interaction between conjugated polymer and carbon nanofillers. Table 1 summarizes different parameters needed to calculate the quenching efficiency ηC of elaborated samples. Figure 3 displays the variation of the quenching efficiency versus PS: MWCNTs concentrations. We can observe a rapid linear increase of quenching efficiency up to 0.5 wt%, where the quenching efficiency ηC evolutes from 0% to 66.8%. Table 1. Quenching efficiency for different PS:MWCNTs concentrations in MEH-PPV/PS:MWCNTs nanocomposites. Figure 3. Variation of the quenching efficiency parameter as function of PS:MWCNTs concentration. For higher concentrations, the quenching efficiency remains almost constant, passing from 66.8% to 76.9%. We can interpret the obtained curve by means of the evolution of the interfacial area aspect with the increase of CNTs concentration. When the concentration of CNTs increases, they tend to agglomerate progressively, leading to inhomogeneous distribution of the nanotubes in the polymer matrix. When the concentration of PS: MWCNTs is greater than 0.5 wt%, there is an ineffective dispersion of CNTs in MEH-PPV polymer. Thus, the quenching efficiency increases with less pronounced manner. 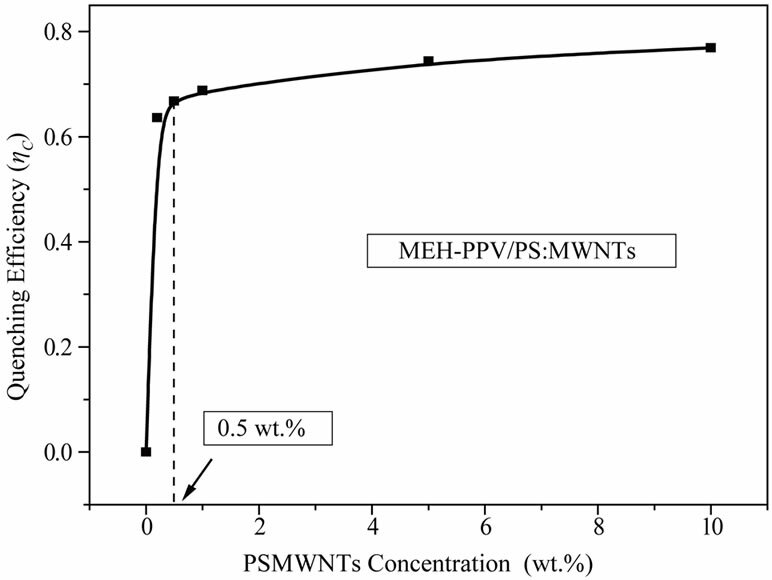 The results indicate that a PS:MWCNTs concentration of 0.5 wt% is the optimum dispersion concentration for MEH-PPV/PS:MWCNTs nanocomposites. We can conclude that the ratio of electron acceptor material in donor polymer matrix is indispensible for photoinduiced charge transfer efficiency and it is crucial to determine the optimum concentration of each nanocomposite. where the slope will be expressed as α. Subsequently, the dependence of fraction as a function of the quencher concentration exhibits that higher defect contents on the surfaces of PS:MWCNTs display lower slopes and so lower quenching constant. Thus, the defects related to great concentrations (more than 0.5 wt%), will distort the MEH-PPV-PS:MWCNTs interaction and affects the donor-acceptor interfacial area aspect. This proves the obtained curve behavior of the variation of quenching efficiency parameter versus the quencher concentration. In conclusion, the photoinduiced charge transfer process is mostly depending on: the MEH-PPV/PS:MWCNTs interaction improvement, the interfacial area aspect and CNTs with less defects distribution. The effect of annealing temperature study is carried out at fixed concentration of PS:MWCNTs in MEH-PPV/PS: MWCNTs nanocomposite. The concentration is fixed at 0.5 wt%, which represents the optimum concentration for the optimal charge transfer efficiency for MEH-PPV/ PS:MWCNTs nanocomposites. Figure 4. Variation of FoC/FC fraction as function of PS: MWCNTs concentration within polymer matrix. form aggregation . Besides, the annealing temperature dependence on PL spectra between 525 and 800 nm, with excitation at 500 nm, isobserved. Figure 6(a) displays the PL spectra of un-annealed and annealed films under various temperatures of 65˚C, 80˚C, 100˚C and 120˚C. We can observe that as the annealing temperature increases, the PL intensity is considerably decreased. For un-annealed and annealed nanocomposite films at 120˚C, the ratio of relative intensity of the main peak is about 0.64. Thus, the decrease of PL intensity indicates that the thermal treatment is a favorable agent to reduce the charges recombination, improve the dissociation of excitons, and then improve the charge transfer in MEHPPV/PS:MWCNTs nanocomposite films. In fact, the thermal annealing process allows a rearrangement of the polymer chains and an orientation of nanotubes within the polymer matrix, leading to an increase of interfaces between MEH-PPV and MWCNTs for optimal charge dissociation efficiency. To investigate the effect of annealing treatment on MEH-PPV/PS:MWCNTs nanofillers nanoscale interactions, the PL data are normalized relative to their maximum emission, as shown in Figure 6(b). We notice that annealing temperature dramatically influence on the normalized PL spectra. For the un-annealed MEH-PPV/PS:MWCNTs nanocomposite film, a PL spectrum with a main peak at 588 nm and a shoulder at 624 nm, is observed. The increase of annealing temperature, significantly, changes on the shape of the overall PL spectra: a reduction of intensity of the main peak, an increase in intensity of shoulder peak, and a red-shift of the whole PL spectrum. For annealed films at 80˚C and 120˚C, an intensity peak appears at 594 and 642 nm, respectively. Figure 5. Normalized optical absorption spectra of the ascast nanocomposite film and the nanocomposite films after annealing temperatures, with MEH-PPV/PS:MWCNTs (0.5 wt%). Figure 6. (a) PL spectra of un-annealed and annealed nanocomposite films, for MEH-PPV/PS:MWCNTs (0.5 wt%) nanocomposites; (b) Normalized PL spectra of un-annealed and annealed nanocomposite films for MEH-PPV/PS:MWCNTs (0.5 wt%) nanocomposites. where, AoT: The absorbance intensity for un-annealed nanocomposite; AiT: The absorbance intensities for annealed nanocomposites at different annealing temperatures; IoT: Integrated photoluminescence intensity for unannealed nanocomposites; IiT: Integrated photoluminescence intensity for annealed nanocomposites at different annealing temperatures. These parameters are summarized in Table 2 and used to follow the quenching efficiency variation as a function of thermal annealing temperatures, as shown in Figure 7. The quenching efficiency is almost increased linearly until an annealing temperature of 80˚C. When the annealing temperature is risen from 80˚C to 120˚C, the quenching efficiency is dramatically dropped. The reduction in quenching efficiency at high annealing temperature can be explained by various factors: 1) It can be seen from Table 2 that absorbance intensity shows a decrease at high temperatures, which is related to the decrease on the thickness of photoactive layer after thermal processing . This can probably contributed to reduce the number of photons absorbed in the photoactive layer as well as the ratio of generated excitons; 2) The reduction of ηT may be related to phase segregation, which is related to the absence of privilegious orientation of carbon nanotubes under annealing temperature. The intensity of fluorescence was quenched significantly since annealing temperature is progressively applied. In order to distinguish between dynamic or static quenching process and to identify the basic mechanism, the Stern-Volmer plot of the dependence on annealing temperature of nanocomposite films was carried out (Figure 8). where, FoT: PL intensity of un-annealed MEH-PPV/PS: MWCNTs nanocomposite; FT: PL intensities of annealed MEH-PPV/PS:MWCNTs nanocomposites; : SternVolmer constant; [T]: Applied annealing temperature. Table 2. Quenching efficiency parameter for different annealing temperatures in MEH-PPV/PS:MWCNTs nanocomposites. Figure 7. Variation of quenching efficiency versus the annealing temperatures of organic nanocomposites. Figure 8. 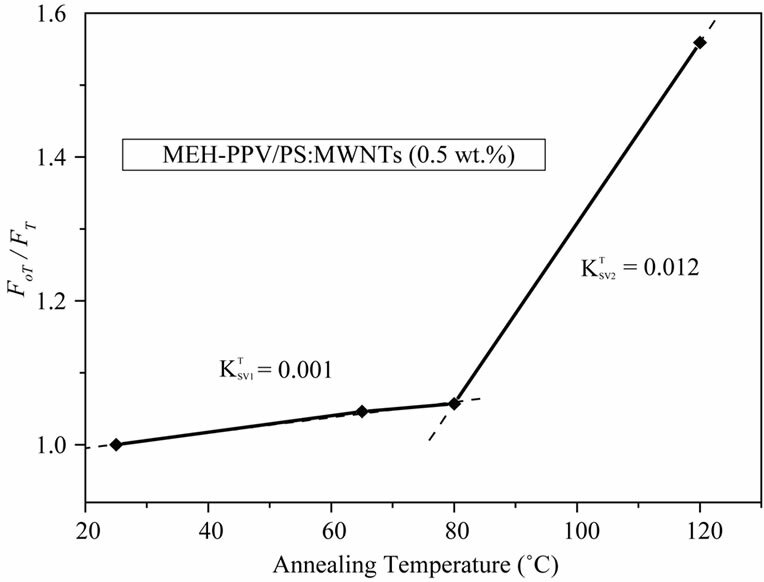 Stern-volmer plot for the MEH-PPV/PS:MWCNTs nanocomposites, for different annealing temperatures. The annealing temperature dependence on SternVolmer constant, shown in Figure 8, is presented by two linear behaviors with transition temperature of 80˚C. The Stern-Volmer constant is enhanced with increasing annealing temperature. Wang et al. reported that dynamic quenching is expected to be more effective at elevated temperature where will increase due to increased rate of diffusion of the quencher within the fluorophore, whereas static quenching will became less effective at elevated temperature due to decreased stability of the complex and thereby reducing . 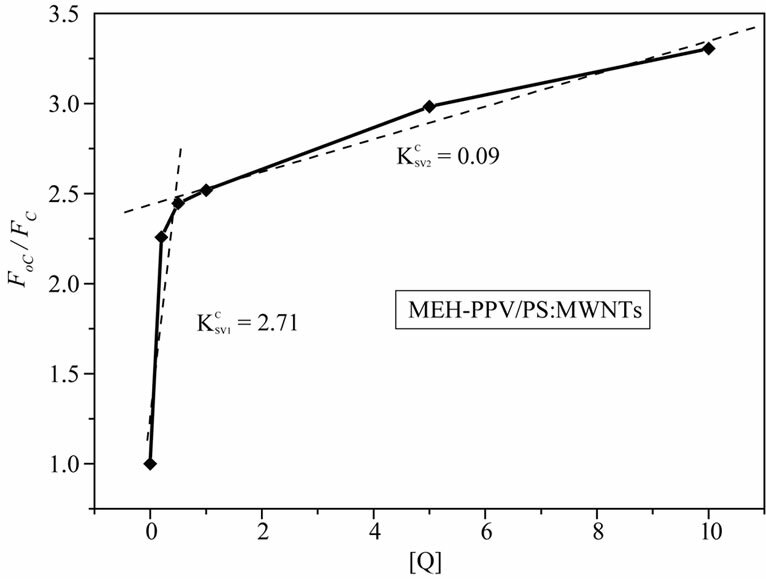 In this case, the increase of Stern-Volmer constant indicates that dynamic quenching is responsible for the decrease in emission intensity of MEH-PPV polymer upon addition of PS:MWCNTs. It is important to note that the collision between the quencher and the fluorophore affects only the excited state of the fluorophore; no changes in the absorption spectra are expected. In contrast, the formation of a ground state complex in static quenching will disturb the absorption spectra of the fluorophore upon adding of the quencher. As shown in Figure 5, the absorption spectra indicate a red spectral shift. In this context, the result supports the interpretation of Zheng et al. [15,16], suggesting that a photoinduiced charge transfer complex could be formed in excited state rather than in the ground state. Thus, in our case, both quenching mechanisms can be considered to arise from complex formation. 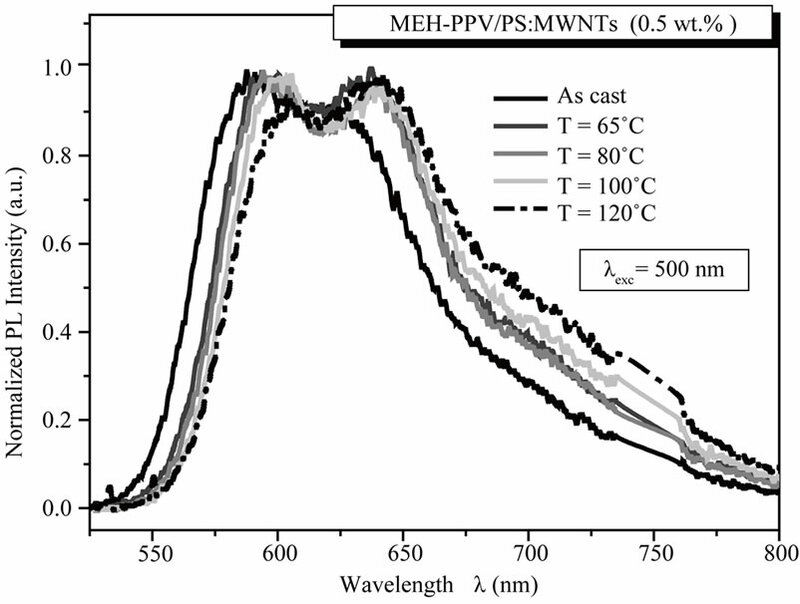 To conclude, we have elaborated and optically characterized a donor/acceptor system holding MEH-PPV/PS: MWCNTs nanocomposites, by reporting the effect of composition and annealing temperature. Adding PS: MWCNTs into MEH-PPV induces great quenching of the photoluminescence of the MEH-PPV, indicating a strong charge transfer from the MEH-PPV to PS:MWCNTs. Quenching efficiency studies imply that MEH-PPV/PS: MWCNTs nanocomposite exhibited a higher degree of PL quenching (η = 76.9%). Moreover, it was revealed that photoinduced transfer is greatly affected by the dispersion of the carbon nanofillers. We found that, for these nanocomposites, the optimum dispersion of PS: MWCNTs amounts was 0.5 wt%. 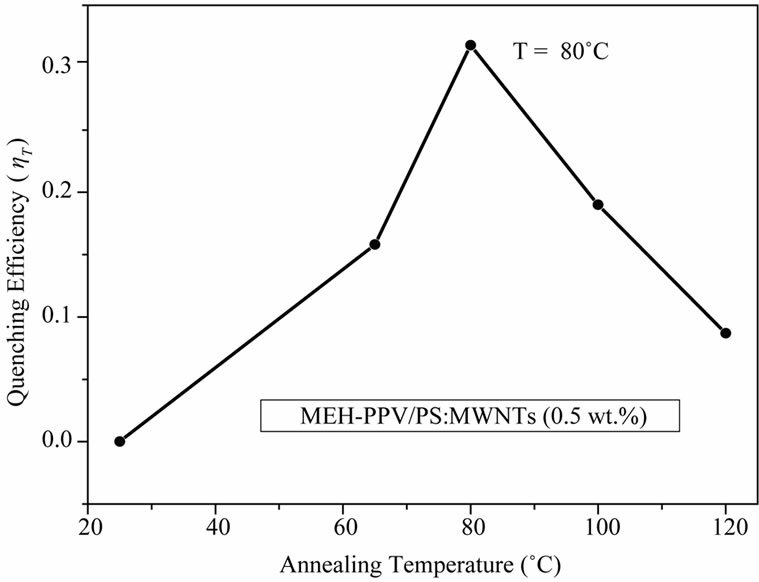 The effect of annealing temperature for MEH-PPV/PS:MWCNTs nanocomposites, for the optimum concentration, was further studied. We have noticed that as the annealing temperature increases, the PL intensity is considerably decreased. Thus, the thermal treatment is a favorable agent to improve the dissociation of excitons and then improve the charge transfer in MEH-PPV/PS:MWCNTs nanocomposites. The quenching efficiency and Stern-Volmer relations exhibit that 80˚C is the optimum annealing temperature. The present results indicated that the MEH-PPV/PS: MWCNTs formed an effective interpenetrating network in the blend ﬁlms, which favors exciton dissociation in the interfacial area and charge transfer in the corresponding domains. The profound understanding of charge transfer behavior tunes a key step on the performance of these nanocomposites to be used as photoactive materials in organic electronics such as photovoltaic devices. N. Chehata gratefully acknowledges Mr. Joel DAVENAS to the reception in Laboratory of Polymer Materials and Biomaterials, University Claude Bernard, Lyon 1, to realize this experimental work. B. Valeur, “Molecular Fluorescence: Principals and Applications,” Wiley-VCH, Weinheim, 2002, pp. 72-124. J. R. Lakowicz, “Principles of Fluorescence Spectroscopy,” Plenum Press, New York, 1983.